SALUTATIONS to the Divine Mother, Durga, who exists in all beings in the form of intelligence, mercy, beauty, who is the consort of Lord Shiva, who creates, sustains and destroys the universe. This festival is observed twice a year, once in the month of Chaitra and then in Aswayuja. It lasts for nine days in honour of the nine manifestations of Durga. During Navaratri (the word literally means “nine nights”) devotees of Durga observe a fast. Brahmins are fed and prayers are offered for the protection of health and property. The beginning of summer and the beginning of winter are two very important junctions of climatic and solar influence. These two periods are taken as sacred opportunities for the worship of the Divine Mother. They are indicated respectively by the Rama-Navaratri in Chaitra (April-May) and the Durga Navaratri in Aswayuja (September-October). The bodies and minds of people undergo a considerable change on account of the changes in Nature. Sri Rama is worshipped during Ramnavmi, and Mother Durga during Navaratri. The Durga Puja is celebrated in various parts of India in different styles. But the one basic aim of this celebration is to propitiate Shakti, the Goddess in Her aspect as Power, to bestow upon man all wealth, auspiciousness, prosperity, knowledge (both sacred and secular), and all other potent powers. Whatever be the particular or special request that everyone may put before the Goddess, whatever boon may be asked of Her, the one thing behind all these is propitiation, worship and linking oneself with Her. There is no other aim. This is being effected consciously or unconsciously. Everyone is blessed with Her loving mercy and is protected by Her. Durga Puja or Navaratri commences on the first and ends on the tenth day of the bright half of Aswayuja (September-October). It is held in commemoration of the victory of Durga over Mahishasura, the buffalo-headed demon. In Bengal Her image is worshipped for nine days and then cast into water. The tenth day is called Vijaya Dasami or Dussera (the “tenth day”). Processions with Her image are taken out along the streets of villages and cities. The mother of Durga (that is, the wife of the King of the Himalayas) longed to see her daughter. Durga was permitted by Lord Shiva to visit her beloved mother only for nine days in the year. The festival of Durga Puja marks this brief visit and ends with the Vijaya Dasami day, when Goddess Durga leaves for Her return to Mount Kailas. This is the view of some devotees. The woman of Bengal welcomes the Goddess with a mother’s love and sends away the image on the last day, with every ceremony associated with a daughter’s departure to her husband’s home and with motherly tears in her eyes. This signifies the parting of Durga from Her beloved mother. Durga Puja is the greatest Hindu festival in which God is adored as Mother. Hinduism is the only religion in the world which has emphasised to such an extent the motherhood of God. One’s relationship with one’s mother is the dearest and the sweetest of all human relations. Hence, it is proper to look upon God as mother. Durga represents the Divine Mother. She is the energy aspect of the Lord. Without Durga, Shiva has no expression and without Shiva, Durga has no existence. Shiva is the soul of Durga; Durga is identical with Shiva. Lord Shiva is only the silent witness. He is motionless, absolutely changeless. He is not affected by the cosmic play. It is Durga who does everything. Shakti is the omnipotent power of the Lord, or the Cosmic Energy. The Divine Mother is represented as having ten different weapons in Her hands. She sits on a lion. She keeps up the play of the Lord through the three attributes of Nature, namely, Sattwa, Rajas and Tamas. Knowledge, peace, lust, anger, greed, egoism and pride, are all Her forms. You will find in the Devi Sukta of the Rig Veda Samhita that Vak, symbolising speech, the daughter of the sage Anbhirna, realised her identity with the Divine Mother, the Power of the Supreme Lord, which manifests throughout the universe among the gods, among men and beasts and among the creatures of the deep ocean. In the Kena Upanishad, you will find that the Divine Mother shed wisdom on Indra and the gods and said that the gods were able to defeat the demons only with the help of the power of the Supreme Lord. The worship of Devi, the universal Mother, leads to the attainment of knowledge of the Self. The story in the Kena Upanishad known as the “Yaksha Prasna”, supports this view. It tells how Uma, the Divine Mother, taught the Truth to the gods. Goddess Shakti thus sheds wisdom on Her devotees. Devi worship is, therefore, worship of God’s glory, of God’s greatness and supremacy. It is adoration of the Almighty. It is unfortunate that Devi is ignorantly understood by many as a mere blood-thirsty Hindu Goddess. No! Devi is not a vicious demoness nor is She the property of the Hindus alone. Devi does not belong to any religion. Devi is that conscious power of God. The words Devi, Shakti, etc., and the ideas of different forms connected with these names are concessions granted by the sages due to the limitations of the human intellect; they are by no means the ultimate definitions of Shakti. The original or Adi Shakti is beyond human comprehension. Bhagavan Krishna says in the Gita: “This is only My lower nature. Beyond this is My higher nature, the life-principle which sustains the universe”. The Upanishad also says: “The supreme power of God is manifested in various ways. This power is of the nature of God, manifesting as knowledge, strength and activity”. Truly speaking, all beings in the universe are Shakti-worshippers, whether they are aware of it or not, for there is no one who does not love and long for power in some form or other. Physicists and scientists have now proved that everything is pure, imperishable energy. This energy is only a form of divine Shakti which exists in every form. A child is more familiar with the mother than with the father, because the mother is very kind, loving, tender and affectionate and looks after the needs of the child. In the spiritual field also, the aspirant or the devotee—the spiritual child—has an intimate relationship with the Mother Durga, more than with the Father Shiva. Therefore, it behoves the aspirant to approach the Mother first, who then introduces Her spiritual child to the Father for his illumination. The Mother’s Grace is boundless. Her mercy is illimitable; Her knowledge infinite; Her power immeasurable; Her glory ineffable; and Her splendour indescribable. She gives you material prosperity as well as spiritual freedom. number of hours spent on it. Devi fought with Bhandasura and his forces for nine days and nine nights. This Bhandasura had a wonderful birth and life. When Lord Shiva burnt Cupid with the fire of His “third eye”, Sri Ganesha playfully moulded a figure out of the ashes, and the Lord breathed life into it! This was the terrible demon Bhandasura. He engaged himself in great penance and on account of it obtained a boon from Lord Shiva. With the help of that boon, he began harassing the worlds. The Divine Mother fought with him for nine nights (the demons have extraordinary strength during the night), and killed him on the evening of the tenth day, known as the Vijaya Dasami. The learning of any science is begun on this highly auspicious day. It was on this day that Arjuna worshipped Devi, before starting the battle against the Kauravas on the field of Kurukshetra. Sri Rama worshipped Durga at the time of the fight with Ravana, to invoke Her aid in the war. This was on the days preceding the Vijaya Dasami day. He fought and won through Her Grace. In days of yore, kings used to undertake ambitious expeditions on the day of the Vijaya Dasami. Those kings who did not go on such expeditions used to go out hunting in the deep forests. In Rajputana, India, even up to this date, people arrange mock attacks on some fort on Vijaya Dasami. This day, however, has much to do with the life of Sri Rama. Nowhere in the history of the world can we find a parallel to the character of Sri Rama as a man, son, brother, husband, father or king. Maharishi Valmiki has exhausted the entire language in describing the glory of Sri Rama. And, we shall be rightly celebrating the Dussera if we make honest efforts to destroy the demon of our ego, and radiate peace and love wherever we go. Let us all resolve to become men of sterling character. Let us resolve and act. The story of Sri Rama is known in almost all parts of the globe, and if we but succeed in following even a hundredth part of His teachings, we shall make our lives more fragrant than the rose and more lustrous than gold! Dussera can also be interpreted as “Dasa-Hara”, which means the cutting of the ten heads of Ravana. So, let us resolve today to cut the ten heads—passion, pride, anger, greed, infatuation, lust, hatred, jealousy, selfishness and crookedness—of the demon, Ego, and thus justify the celebration of Dussera. Religious observances, traditional worship and observances at times have more than one significance. Apart from being the adoration of the Divine, they commemorate stirring events in history, they are allegoric when interpreted from the occult standpoint and, lastly, they are deeply significant pointers and revealing guides to the individual on his path to God-realisation. Outwardly, the nine-day worship of Devi is a celebration of triumph. This nine days’ celebration is offered to the Mother for Her successful struggle with the formidable demons led by Mahishasura. But, to the sincere spiritual aspirant, the particular division of the Navaratri into sets of three days to adore different aspects of the Supreme Goddess has a very sublime, yet thoroughly practical truth to reveal. In its cosmic aspect, it epitomises the stages of the evolution of man into God, from Jivahood (the state of individualisation) to Shivahood (the state of Self-realisation). In its individual import, it shows the course that his spiritual practice should take. Let us, therefore, examine in detail the spiritual significance of Navaratri. The central purpose of existence is to recognise your eternal identity with the supreme Spirit. It is to grow into the image of the Divine. The supreme One embodies the highest perfection. It is spotless purity. To recognise your identity with That, to attain union with That, is verily to grow into the very likeness of the Divine. The aspirant, therefore, as his initial step, has to get rid of all the countless impurities, and the demoniacal elements that have come to cling to him in his embodied state. Then he has to acquire lofty virtues and auspicious, divine qualities. Thus purified, knowledge flashes upon him like the brilliant rays of the sun upon the crystal waters of a perfectly calm lake. This process demands a resolute will, determined effort, and arduous struggle. In other words, strength and infinite power are the prime necessity. Thus it is the Divine Mother who has to operate through the aspirant. Let us now consider how, on the first three days, the Mother is adored as supreme power and force, as Durga the Terrible. You pray to Mother Durga to destroy all your impurities, your vices, your defects. She is to fight with and annihilate the baser animal qualities in the spiritual aspirant, the lower, diabolical nature in him. Also, She is the power that protects your spiritual practice from its many dangers and pitfalls. Thus the first three days, which mark the first stage or the destruction of impurity and determined effort and struggle to root out the evil tendencies in your mind, are set apart for the worship of the destructive aspect of the Mother. Once you have accomplished your task on the negative side, that of breaking down the impure propensities and old vicious habits, the next step is to build up a sublime spiritual personality, to acquire positive qualities in place of the eliminated demoniacal qualities. The divine qualities that Lord Krishna enumerates in the Gita, have to be acquired. The aspirant must cultivate and develop all the auspicious qualities. He has to earn immense spiritual wealth to enable him to pay the price for the rare gem of divine wisdom. If this development of the opposite qualities is not undertaken in right earnest, the old demoniacal nature will raise its head again and again. Hence, this stage is as important in an aspirant’s career as the previous one. The essential difference is: the former is a ruthless, determined annihilation of the filthy egoistic lower self; the latter is an orderly, steady, calm and serene effort to develop purity. This pleasanter side of the aspirant’s Sadhana is depicted by the worship of Mother Lakshmi. She bestows on Her devotees the inexhaustible divine wealth or Deivi Sampath. Lakshmi is the wealth-giving aspect of God. She is purity itself. Thus the worship of Goddess Lakshmi is performed during the second set of three days. Once the aspirant succeeds in routing out the evil propensities, and develops Sattwic or pure, divine qualities, he becomes competent to attain wisdom. He is now ready to receive the light of supreme wisdom. He is fit to receive divine knowledge. At this stage comes the devout worship of Mother Saraswathi, who is divine knowledge personified, the embodiment of knowledge of the Absolute. The sound of Her celestial veena awakens the notes of the sublime utterances of the Upanishads which reveal the Truth, and the sacred monosyllable, Om. She bestows the knowledge of the supreme, mystic sound and then gives full knowledge of the Self as represented by Her pure, dazzling snow-white apparel. Therefore, to propitiate Saraswathi, the giver of knowledge, is the third stage. 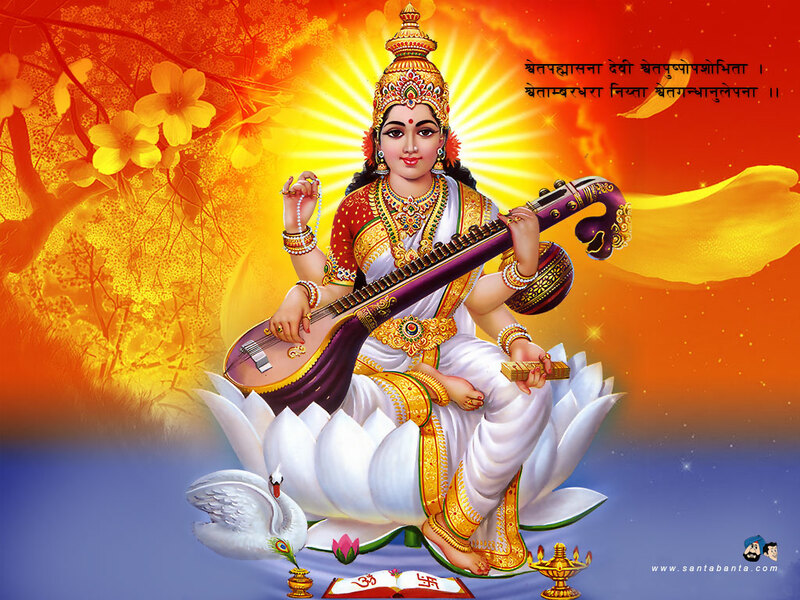 The tenth day, Vijaya Dasami, marks the triumphant ovation of the soul at having attained liberation while living in this world, through the descent of knowledge by the Grace of Goddess Saraswathi. The soul rests in his own Supreme Self or Satchidananda Brahman. This day celebrates the victory, the achievement of the goal. The banner of victory flies aloft. Lo! I am He! I am He! This arrangement also has a special significance in the aspirant’s spiritual evolution. It marks the indispensable stages of evolution through which everyone has to pass. One naturally leads to the other; to short-circuit this would inevitably result in a miserable failure. Nowadays many ignorant seekers aim straight at the cultivation of knowledge without the preliminaries of purification and acquisition of the divine qualities. They then complain that they are not progressing on the path. How can they? Knowledge will not descend until the impurities have been washed out, and purity is developed. How can the pure plant grow in impure soil? Therefore adhere to this arrangement; your efforts will be crowned with sure success. This is your path. As you destroy one evil quality, develop the virtue opposite to it. By this process you will soon bring yourself up to that perfection which will culminate in identity with the Self which is your goal. Then all knowledge will be yours: you will be omniscient, omnipotent and you will feel your omnipresence. You will see your Self in all. You will have achieved eternal victory over the wheel of births and deaths, over the demon of worldliness. No more pain, no more misery, no more birth, no more death! Victory, victory be yours! Glory to the Divine Mother! Let Her take you, step by step to the top of the spiritual ladder and unite you with the Lord! 1. A special ritualistic worship of the Mother is conducted daily, which includes the recitation of the Durga Saptashati. 2. Laksharchana for the Mother in the temple, with recitation of the Sri Lalita Sahasranama, is also conducted. 3. All are exhorted to do the maximum number of Japa of the Navarna Mantra, Aim hreem kleem chaamundaayai vichche, or the Mantra of their own tutelary Deity. 4. An elaborately decorated altar is set up for the evening Satsangs, with the picture of Mother Durga for the first three days, Mother Lakshmi for the next three days, and Mother Saraswathi for the last three days. Many sacred verses from the scriptures are recited and many Kirtans are sung. 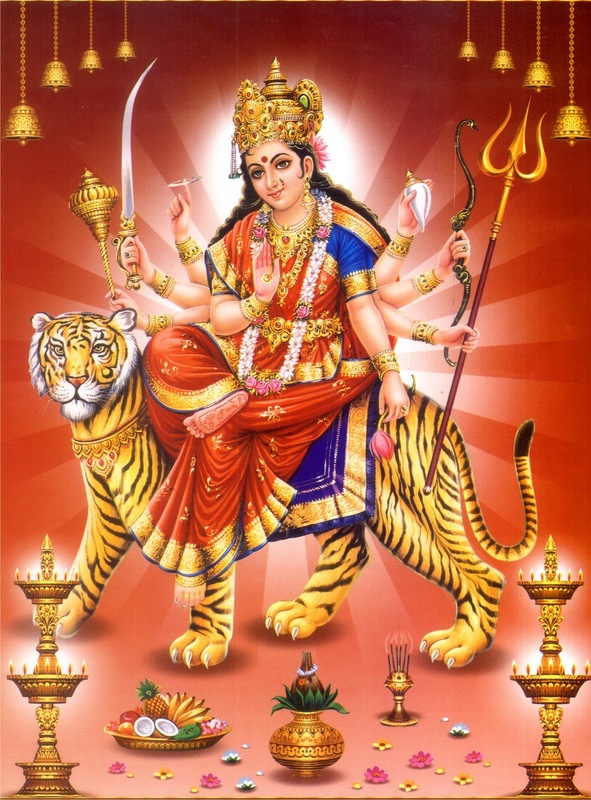 The Durga Saptashati or the Devi Mahatmya is recited and explained in discourses. The function concludes with the formal floral worship and Arati. Sometimes scenes from the Devi Mahatmya are also enacted. 5. Earnest spiritual aspirants fast with milk and fruits only on all the nine days, or at least once in each of the three three-day periods. 6. Besides the books representing Saraswathi, all instruments and implements like typewriters, printing machinery, etc., are also worshipped on the ninth day. 7. On the Vijaya Dasami day, all aspirants en masse are given initiation into various Mantras according to their tutelary Deities. Deserving aspirants are initiated into the holy order of Sannyas. Initiation in the study of the alphabets is given to young children, and to the old children also! New students commence their lessons in music, etc. During the morning Satsang the books which were worshipped on the ninth day are again worshipped and a chapter from each of the principal scriptures like the Gita, Upanishads, Brahma Sutras, Ramayana, and Srimad Bhagavatam is recited. 8. On the Vijaya Dasami day, there is Kanya Puja also. Nine girls below the age of ten are worshipped as the embodiment of the Divine Mother. They are fed sumptuously and, amongst other things, presented with new clothes. 9. On this last day a grand havan is conducted in the temple, with recitation of the Durga Saptashati and other verses in praise of the Divine Mother.